Trending at $301.66Trending price is based on prices over last 90 days. Sony SEL35F18 35mm F1.8 OSS Lens For Sony E-Mount - Good condition! 80 product ratings - Sony SEL35F18 35mm F1.8 OSS Lens For Sony E-Mount - Good condition! Sony SEL35F18 35mm F/1.8 OSS Lens. 80 product ratings - Sony SEL35F18 35mm F/1.8 OSS Lens. Sony 35mm F/1.8 OSS E Mount Lens SEL35F18! USPS 2-3 days w/ track + insurance!! 80 product ratings - Sony 35mm F/1.8 OSS E Mount Lens SEL35F18! USPS 2-3 days w/ track + insurance!! Sony 35mm f/1.8 OSS Alpha E-mount Prime Lens #SEL35F18 BRAND NEW!! 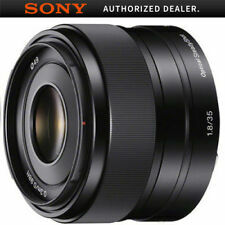 80 product ratings - Sony 35mm f/1.8 OSS Alpha E-mount Prime Lens #SEL35F18 BRAND NEW!! This page was last updated: 25-Apr 15:36. Number of bids and bid amounts may be slightly out of date. See each listing for international shipping options and costs.